ORNAMENT HOOKS. 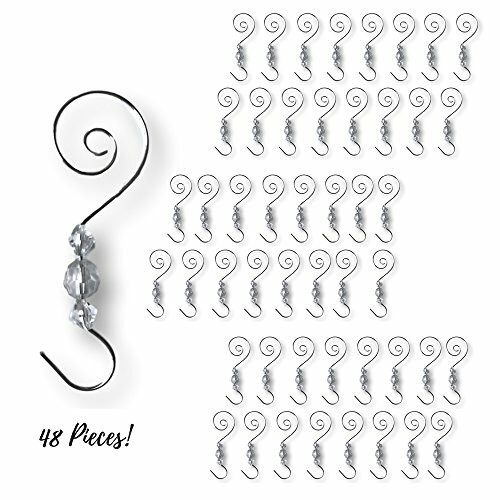 Set of 48 decorative Christmas tree decor 'S' hooks for ornaments. TREE DECORATION HANGERS. Add a little pizzaz to your tree ornaments with these faux crystal beaded hooks. CRAFTING SUPPLIES. Your craft projects will look extra special with this beaded hanging hook. CHRISTMAS DECORATIONS. Your Christmas tree will have an extra festive look with ornamental hooks to hang your decorations with. MEASUREMENT: Each hook is approximately 2" high.